This contribution shows how molecular electrochemistry may benefit from the application of DFT methods combined with implicit solvent models. The progress in quantum chemical calculations, including efficient solvation models, has brought about the development of effective computational protocols that allow accurate (to 0.05 V) reproduction of experimental redox potentials of mono- and dinuclear complexes, including electrocatalytically relevant systems and mixed-valence compounds. 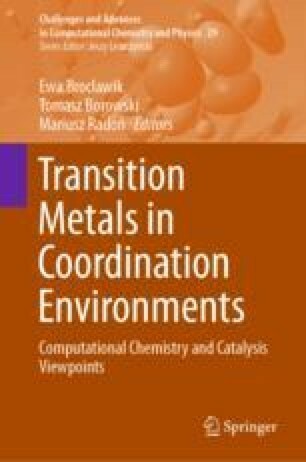 These calculations may also help to understand how electronic and structural factors, modulated by the changes in both first and second coordination spheres, and the local environment (dielectric medium and specific interactions), govern the ability of transition metal complexes to undergo electron transfer (ET) processes. Understanding the principles that lie behind it is of great importance in redox chemistry and catalysis, and biological systems. After a brief introduction to modelling approaches and discussion of challenges for calibration of computational protocols based on comparison with experimental data, a number of noteworthy case studies are given. Specifically, the determination of ferrocenium/ferrocene absolute potentials in solvents commonly used in electrochemistry is discussed, the redox behaviour of Cu and Fe systems affected by H-bonding, followed by the presentation of intriguing properties of mono- and bimetallic Mo/W scorpionates. Particularly, electrochemical communication between metal centres and a baffling (auto)catalytic dehalogenation triggered by ET through a C−H⋯Oalkoxide hydrogen bond, the mechanism of which was unravelled owing to the application of dispersion-corrected DFT calculations, are highlighted. We thank Prof. Ewa Brocławik (Polish Academy of Sciences), Dr. Mariusz Radoń (Jagiellonian University) and Klemens Noga (Academic Computer Center CYFRONET) for a long-standing collaboration and very valuable, fruitful discussions. Support for this work from the PL-Grid Infrastructure is gratefully acknowledged.